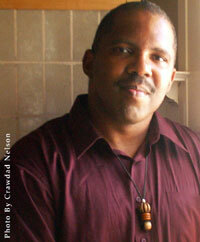 This manuscript was selected for publication after finishing as a finalist in the 2006 MSR Poetry Book Award. Indigo Moor is a 2003 recipient of Cave Canem‘s Writing fellowship in poetry and Vice President of the Sacramento Poetry Center.. He is the winner of the 2005 Vesle Fenstermaker Poetry Prize for Emerging Writers. A 2005 T.S. Eliot prize finalist, Indigo has received scholarships to the Summer Literary Series in St. Petersburg Russia, the Idyllwild Summer Poetry Program, the Indiana University Writer’s Conference, and the Napa Valley Writer’s Conference. His work has appeared in the Xavier Review, LA Review, Mochila Review, Boston University’s The Comment, the Pushcart Prize nominated Out of the Blue Artists Unite, Poetry Now, The Ringing Ear, the NCPS 2006 Anthology, and Gathering Grounds. 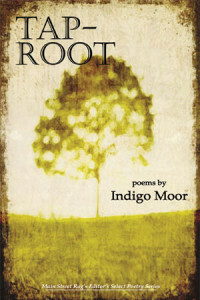 Indigo Moor is also a reviewer for Black Issues Book Review. Sense-embedded, peeled to perceptive freshness, with a gift for the muscular and concentrating phrase, Indigo Moor’s first book engages not only family and personal history, but the broader culture’s as well. These are poems weighted with the real world, consequential, revelatory, and moving. The vivid, dexterous work of Yusef Komunyakaa and Jean Toomer’s crisp, poignant Cane come to mind, but Indigo Moor is, finally, his own man. His intricate, breathtaking poetry is lushly musical and allusive, alive, inventive–a muscular jazz. In his impressive debut, Tap-Root, Indigo Moor is both dazzlingly cosmopolitan and down home in the same breath–simultaneously drenched in opera’s ornate cascades, the blues, and the blue jay’s song: a son of the South and a son of the universe! The crucible of the past is relentless, Indigo Moor tells us in one poem, and in another, “The Better Truth,” that the mind stores that part of history that glimmers. Both are true in his debut collection, Tap-Root. These are poems that tremble and ache with urgency as Moor longs for, returns to, leaves behind, and elegizes his South–a landscape of hardship, beauty, work, and the sweet music forged out of survival. with the taste of honeysuckle on my tongue. wires weighed down with crows and thick heat. going to come, it better be soon. taloned to the phone’s bad news. fog and brain-ash to black out the moon. focuses backwards and the mind grays decades. together with rawhide ties and silk thread. my hands don’t know how to tame. There is no balm for the past’s dull ache. I worship these women of salt. Backs curved, cloth-tied locks thick. full crazy enough to kill them all. They speak harvest songs in tongues. Hard beauty bent, jackknifing in fields. Scythe swing! Quails spring into trout-leaps. cupped around a crescent of soil. pulled from a block of wood. Corn and wheat were sown to concrete. I set my family’s feet North. would all my ancestral stories.